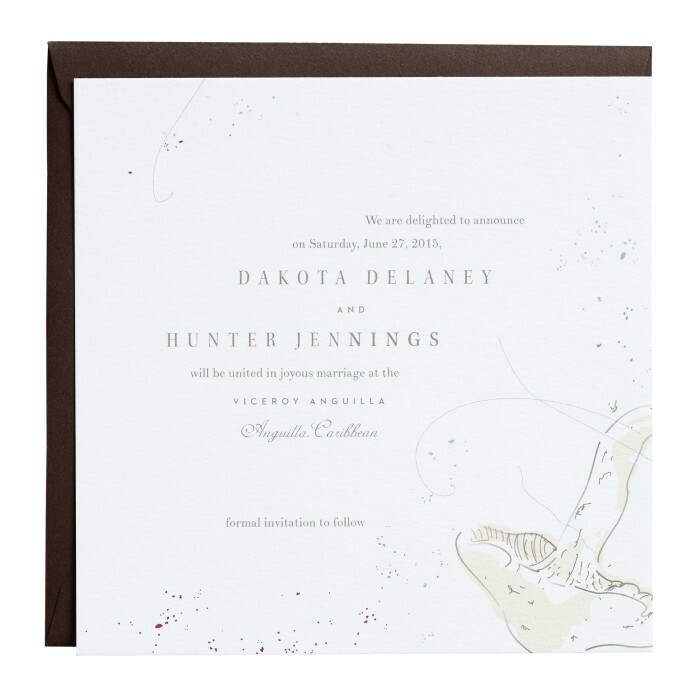 The strikingly effortless Dakota Save the Date mixes rugged and refined elements and visually sets the stage for your wedding. It pairs organic imagery with ombré textural speckles. Flowing asymmetrical text, that is compositionally pleasing, lends ease and visual movement. This piece is flat printed single-sided on luxuriously thick cover stock with a subtle eggshell textured finish. The Dakota collection is artful meets modern sophistication. Inspired by nature, these effortless yet refined pieces featuring organic hand-drawn imagery convey whimsy and movement. $404 for 100 flat printed Save the Dates and matching matte colored Envelopes.